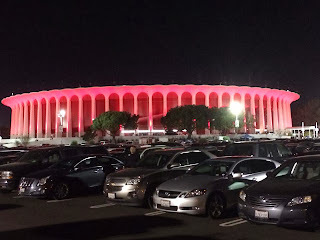 The Forum is the venue that I have seen the most concerts in over the years, starting back in 1984 when I caught Yes there for the 90125 tour. Since then I have seen bands from all genres including Rush, Tool, and Muse, and many others that have faded away in my mushy brain. Plus, I was a King Hockey season ticket holder back in the early 1990s, so I am pretty familiar with this arena. And I have to say, last month I saw the Eagles at the newly renovated Forum Presented by Chase, and I was blown away. 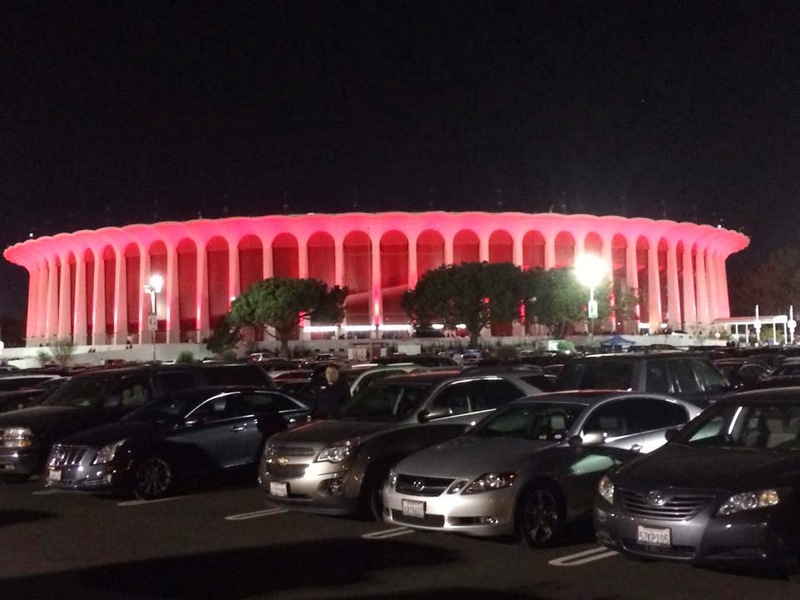 The Forum is located just east of Los Angeles International Airport in Inglewood, California. It was built in 1967 by Jack Cooke, the owner of the Lakers at the time, to house his new NHL team -- the Kings. It cost $16 million to build and was styled after the Roman Coliseum. Sort of. Every type of event that you can imagine took place at the forum over the next 40 years. The Lakers won multiple championships, the Kings almost won a championship, and boxing and wrestling matches were common. But there were also concerts galore, and every big name band played on its stage, from Elvis to Led Zeppelin to Michael Jackson. There were also a lot of live albums recorded there, including the Eagles Live and Kiss Alive. As times and demand changed, it turned out that the design of the arena did not allow for extensive concessions or revenue-generating skyboxes, and eventually the Kings and Lakers departed for Staples Center in the late 1990s. 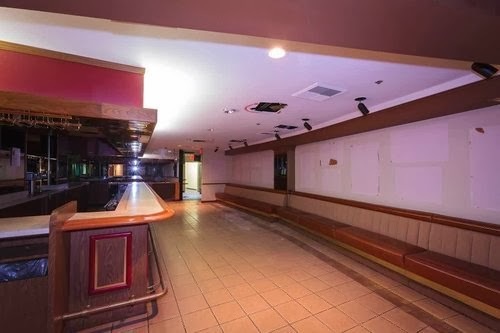 A church purchased the Forum in 2000, and would hold services for its 12,000 members there and continued to rent the facility out for concerts, and its condition deteriorated as maintenance was deferred. By the time I saw Muse there a few years ago, the Forum was a dump and pretty gross. After a dozen years of benign neglect, Madison Square Garden purchased The Forum for $23.5 in June of 2012, renamed it The Forum Presented by Chase (title sponsor, you know),and promised to dump $50 back into the facility. It was money well spent! They painted it red again, like it should be, and spent the cash in the right places. 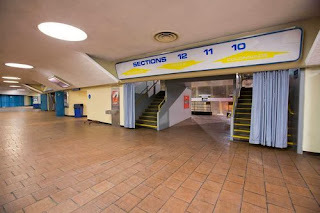 For starters, they have turned the building into a dedicated concert arena, and there is no pressure to turn it into a basketball arena or hockey rink multiple times per month. This allowed them to fix the acoustics and install permanent PA features to provide the best sound possible. The scoreboard has been gone for years, which is was a huge improvement all by itself. The lobbies, Forum club and concession areas are all completely re-vamped, and it has a lot classier feel. All of the seats have been replaced, the old ceramic floor tiles have been swapped out with carpet, and the signage no longer has the 1970s vibe. Most impressively, they re-did the restrooms and the “trough of glory” has been removed from the men’s rooms and been replaced by urinals! Very exciting! Also, they have installed modern food choices beyond the former hot dogs, nachos and beer. Of course the food and drinks are not exactly cheap, but are they ever when you go out to see a show? Keep in mind that this is a 46-year old facility design and there was only so much they could do. There are still no skyboxes, you still have to go down a million stairs to the basement to find a restroom, and there is not really any good placed to sit around and enjoy a drink or two, except for your seat. By the way, the capacity of the building is now 17,500. My only criticism for the evening was the way that the City of Inglewood handled traffic, and the terrible parking situation at the Forum. Back when I had Kings season seats they had all of that figured out and getting in and out of the parking lot was not too bad. Apparently the powers that be have forgotten everything they learned years ago, and it was a fight through nasty gridlock to get into a parking spot located half a mile away in a dimly lit park of the Hollywood Park lot. I barely made it to my seat in time for the start of the show. I’m sure they will figured that out pretty quickly. At least the parking lot staff was as nice as everybody else that worked there! So, if you are interested in any of the shows coming up at the Fabulous Forum, it is a real player again and you really ought to consider checking it out for yourself. I would not hesitate to go back again!